Old Granny Fox in "Granny And Reddy Fox Go Hunting"
Old Granny Fox in "Reddy Is Made Truly Happy"
Old Granny Fox in "Reddy Is Sure Granny Has Lost Her Senses "
Old Granny Fox in "Old Granny Fox Is Caught Napping"
Old Granny Fox in "Reddy Fox Is Impudent"
Old Granny Fox in "Granny Fox Admits Growing Old"
Old Granny Fox in "Reddy Fights A Battle"
Old Granny Fox in "Granny Fox Promises Reddy Bowser's Dinner"
Old Granny Fox in "Old Man Coyote Does A Little Thinking"
Old Granny Fox in "Granny And Reddy Talk Things Over." Old Granny Fox in "Granny Fox Plans To Get A Fat Hen"
Old Granny Fox in "Farmer Brown's Boy Forgets To Close The Gate"
Old Granny Fox in "A Midnight Visit"
Old Granny Fox in "A Dinner For Two"
Old Granny Fox in "Farmer Brown's Boy Sets A Trap"
Old Granny Fox in "Prickly Porky Enjoys Himself"
Granny Fox is very wise. When a deep winter snow carpets the Green Forest and nearby meadow, Granny Fox and Reddy have some disagreements on how best to find some food. But Granny — with her years of experience — wins out over Reddy and teaches him quite a bit about patience, common sense, and resourcefulness. 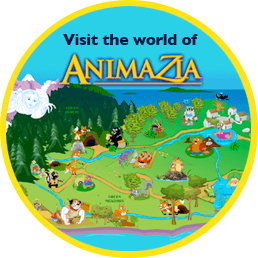 Granny Fox and Reddy live with their friends in the world of Animazia: the amazing story of animals. Inspired by the works of groundbreaking environmentalist children's book writer Thornton Burgess, these stories, games, educational materials teach kids about the foxes living in the forest environments in a near-boreal region.